﻿ Comfort Loft City Centre @ IMAGO Shopping Mall, Kota Kinabalu | FROM $39 - SAVE ON AGODA! "The good part : very nice place with garden view." Have a question for Comfort Loft City Centre @ IMAGO Shopping Mall? "Swimming pool is big and so nice." "Staff gave full assist to me." 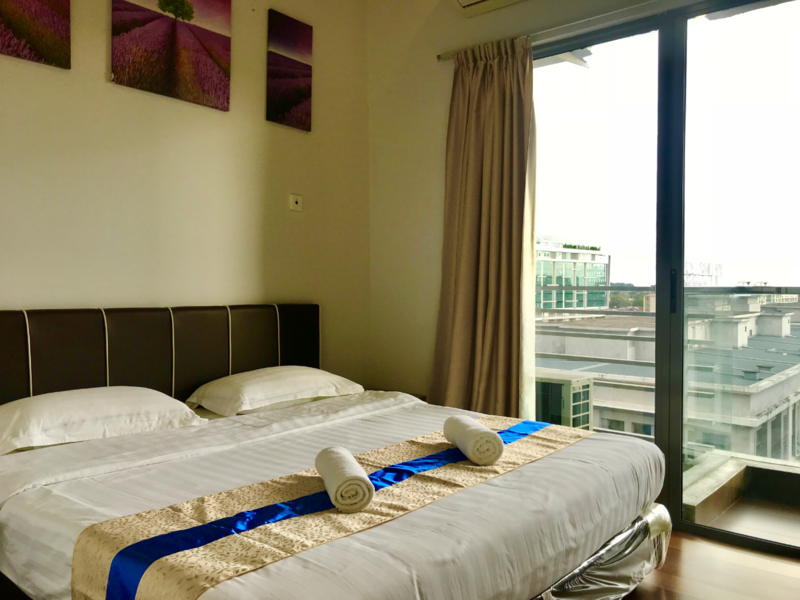 "The unit we stayed in was nice and adequately equipped with..."
Comfort Loft City Centre @ IMAGO Shopping Mall, located in Central Business District, Kota Kinabalu, is a popular choice for travelers. Set from the excitement of the city, this 3-star hotel commands an excellent location and provides access to the city's biggest attractions. With its convenient location, the hotel offers easy access to the city's must-see destinations. The facilities and services provided by Comfort Loft City Centre @ IMAGO Shopping Mall ensure a pleasant stay for guests. 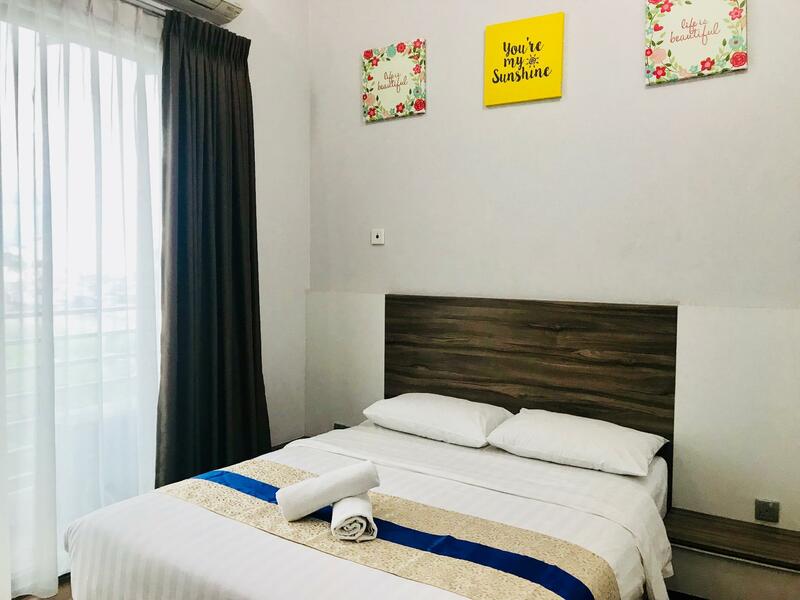 Guests of the hotel can enjoy on-site features like convenience store, daily housekeeping, free Wi-Fi in all rooms, kitchen, private check in/check out. All guest accommodations feature thoughtful amenities to ensure an unparalleled sense of comfort. The hotel offers wonderful recreational facilities such as fitness center, golf course (within 3 km), outdoor pool to make your stay truly unforgettable. Discover an engaging blend of professional service and a wide array of features at Comfort Loft City Centre @ IMAGO Shopping Mall. A security deposit of MYR 200 is required upon check-in for charges or damages during the stay and will be refunded upon departure. I stay here because before this I was stay in this apartment. But this time a bit frustrated because the pool is close. The room spacious. Around 1.00a.m. the aircond in the living room make noise because the aircond produce ice. According to my brother possibly because the aircond not been service for long time. Pros is only the location. Others are all conts. They dont give clear information and instruction, hence we need to walk quite a distance since we didnt drive. The place is dusty. They dont change towels n bedsheet at all. We use the same towel n bedsheet for 4 days. Tv got no channel. amazed with d interior design.. open area --kitchen n dining and living room..very comfy bed. tip top cleanliness. BuT for first timers wud be difficult to go around. it was confusing at first. nevertheless wud stay there again. next time. Experienced a couple of unsatisfactory events during my stay. The boiling point for me was the customer service/staff during BOTH check in& check out. Not only did they not answer calls & kept rejecting but also responded my questions pretty vaguely, if not ignoring my questions at all. Upon check in we had to wait +/- 30mins for the staff to arrive when we had already agreed to meet at 2pm in advance. We had a long day travelling by car and we looked forward to unpacking and resting in our rooms but kept being delayed. Upon check out we also agreed to meet before 10am as we needed to leave the city by 10 sharp, yet again, we had to wait for the staff. When we texted the morning at approximately 9am through whatsApp, she had only seen the message without responding. Moving on to over 40-50mins, she then responded by telling us to see a representative, where we found out that the staff we initially dealt with was on leave. This is too unprofessional. Wasted too much time. Overall is good. Except the washing & drying machine. It the room there is a 2-in-1 washer & dryer. The dryer function is not working. Every time when it finish washing cycle and going to start drying cycle, it will stop automatically. But there is a drying rack so you can put your washed clothes on it for drying. 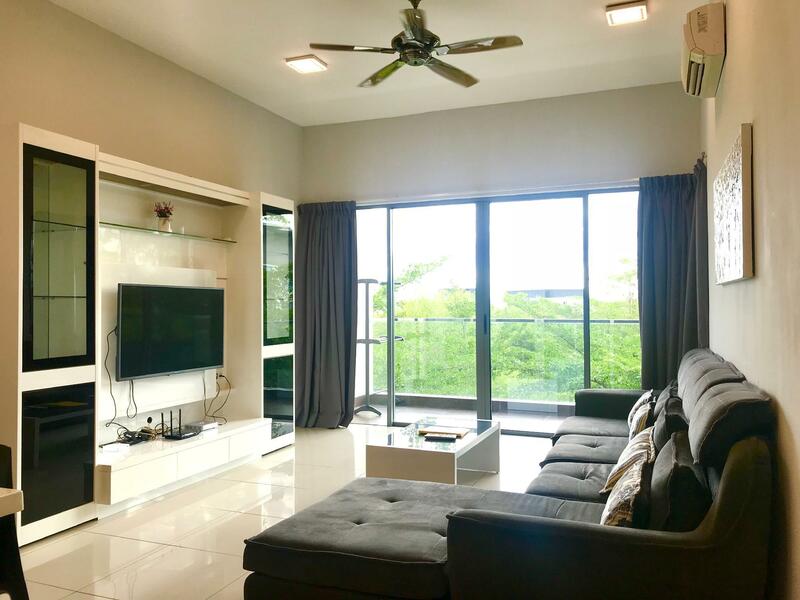 practically a fully equipped apartment, surprised to see 2 rooms and 2 bathrooms with a kitchen, loungeroom and even a laundry room. Acceas to a huge private coutyard that spans the size of the large shopping mall below and 2 pools. We had a very pleasant stay despite the inconvenience of phone based meet-n-greet check in system . Staff were helpful , and went out of their way to assist, Ceris and the kind lady who informed me of an overlapped booking i accidentally made. Thank you. Negative points: the restrictive (one) smart card access system, meaning the group cannot do individual activities and must meet up to enter property! The tiny single beds and the horrific fluorescent lighting. Recommeded for longer stay here especially if travelling with kids. Cik wana, the receptionist handed the check in professionally. I 'sms' her early to inform of my late arrival and she guided me well and ensure that by the time i arrived she is already at the lobby waiting to bring me to the apartment. She also contacted me throughout my stay to ensure everything is going fine and if there is anything else that i may need help with. Will definitely stay again. The door bell not working properly. Small sound. Sometime the housekeeper simply just entering the room without noticed. Feel not safe when they just entering. Fix the door bell and notice the customer before enter. The hot water in the master bed room wasn’t working at all. Contacted the person in charge and what I got was ‘Ok’ from them. The apartment isn’t very well maintained. The washing machine comes with the dryer which is a great thing to have. Great location and easy communication with owner. The unit we stayed in was nice and adequately equipped with amenities. However, the bathroom door needs to either be cleaned or replaced as it had mildew around its edges. I’m very thankful to the management. Because I made a mistake booking wrong date and arrived at the apartment without knowing. After knowing the error I made. Staff gave full assist to me. I book a studio but during the check in time, Studio is all fully book. And it’s midnight. After servaral calls. They found a 3 bed room and gave me the keys. Without their assistance I would be sleeping on the street. Thank you very much. Overall the unit was excellent and reception staff was OK however the only complaint is directly to housekeeping. The first day, housekeeping was very late. We tried to call the housekeeping supervisor but she rejects the call and switch off the phone. Luckily the reception had contacted her. But to our disappointment, the housekeeping does not change the towels and bed sheet on the first day. For the second day, housekeeping comes very late after 3 pm, in which we expect it to be done earlier. It is frustrating that you just came back from activities to find that the room is still not clean. I have to specify requesting to change bed-sheet and towel. I think if i did not mentioned that to reception, surely it will not be changed. 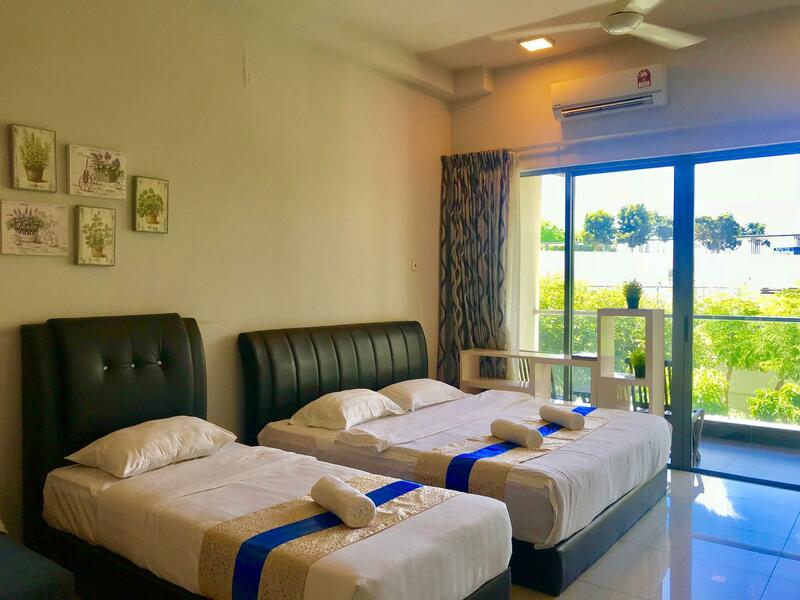 since it is mentioned that daily cleaning is provided, it would be appreciate that Sunset & Sea view (the company managing the unit) to control the housekeeping personnel and not asking customer to contact them personally. Accessible to other places, if you need to go shopping, just go down from the hotel & use the access door going to the mall. Stayed 1 night at 2 bedroom apartment at Loft E with my friends. The hotel is big, clean, nice view if the city and seaside, minimalist and modern design. The lobby guard is not accommodating when we check-in, access key is needed upon check-in for you to enter the main lobby and to use the elevator. Improve the check-in process. Stayed for 2 nights at Loft E 2 bedroom apartment together with my friends. 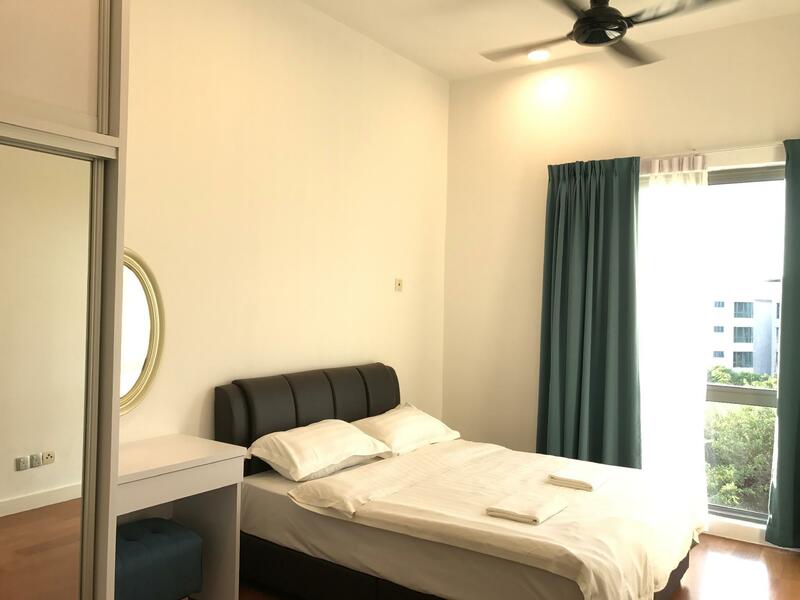 The place is big, clean, location is at the city center, nice view of the city/sea view, with internet access, and complete with kitchen tools. Hotel staff are good (Zur, Fina & Tiffany). However, there's a need to improve the reception/check-in of guests. The guests are required to call the staff to be able to check-in & get the access key. It's a big hassle for foreigner guests without roaming mobile phones. Our confirmed booking is at Loft A, unfortunately, the hotel staff told us we will transfer to Loft E, it's a big hassle to walk too far from Loft A to E, bringing our luggage. Need to inform the guest of the confirmed/final Loft reservations prior to check in at least a week before.